Over time, all backboards will wear out. When the time comes, a knee-jerk reaction might be to throw out the old system and look to purchase a whole new system. While, in some cases, this might be necessary, many times you can save considerable amounts of money by simply replacing the backboard of the in ground basketball goal. Lifetime Products makes many of their systems with component backboards that can be purchased retail, rather than replacing the entire goal. Here is the way to determine if your basketball system has a backboard that can be replaced. 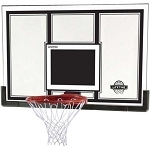 What is the backboard material that is used on your inground basketball system? 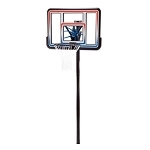 Lifetime in ground basketball systems can have several different backboard materials. Of those, backboards that are made of polycarbonate, acrylic, and polyethylene plastic are replaceable. If your backboard is made with tempered glass, the only way to replace the item is calling in directly to Lifetime Products and order the specific part of your in ground goal. Please note that if your system has a polycarbonate, acrylic, and polyethylene basketball backboard you cannot change these materials to tempered glass. Tempered glass backboards weigh much more than similarly-sized acrylic, polycarbonate, and plastic backboards. The mounting arms for glass backboards are much larger. What is the shape of your pole? Now, assuming you have a backboard with the correct backboard material, the next thing we will look at is the shape of your pole. Lifetime makes in ground basketball systems with both round and square poles. The pole shape matters because the mounting bracket that attaches the backboard to the main pole of the system will differ between these two shapes of pole. 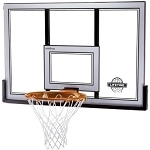 If your systems has a square pole, the mounting bracket for your backboard will not fit retailed Lifetime backboards; you will have to contact Lifetime customer service to replace it. If your pole is round, than we are still on the right track. What size of pole do you have on your basketball hoop? Lifetime basketball systems have several different pole-size options. For their round-shaped poles, options of 2.75 inches, 3-inches, and 3.5 inches are available. To replace your backboard for an in ground basketball goal, you will need a pole size of 3.5 inches. Smaller poles will have smaller brackets that will keep you from fitting retailed replacement backboards. If your pole is smaller in size, you will need to contact Lifetime customer service to replace the backboard. Otherwise, continue forward to the next step. Do you see a Y-bracket that attaches to the backboard? The mounting bracket contains several components. One of these mounting brackets that is found on basketball systems with a round pole measuring 3.5 inches in diameter has 4 mounting arms that attach directly to the frame of the backboard. The other design for the same size and shape of pole has 4 mounting arms that come off from the pole of the system and then attach to a Y shaped bracket. The Y-bracket is the last part of the mounting bracket that actually attaches to the backboard. If you see this Y-bracket (it is very obvious, it simply looks like a large capital letter Y), then you can continue to the last step. Are you still reading? Good. That means we can be about 90% certain that you have a system that has a replaceable backboard. The last thing to confirm is the age of your system. The mounting brackets have actually changed sizes in the past 10 years. If your basketball hoop is older than that, you can still purchase a retailed backboard, but you will also need to purchase a new Y-bracket. The Y-bracket consists of two parts and can be purchased from Lifetime customer service. If your in ground basketball system is younger than 10 years old, then literally any retailed Lifetime backboard, including ones that are larger or smaller than your current backboard, are going to be compatible with your current system. Please note that even if you have to purchase a new Y-bracket you will still be saving money compared to replacing the entire system. Lifetime Products can be reached at 1-800-225-3865. Lifetime Backboard are extremely durable and difficult to break, but even the best of products can wear down over time. Luckily you don't have to get a whole new system. New systems are often expensive and you may not want to go through the process of getting another one. Just call Lifetime and they will be happy to help you acquire a new backboard for your system. Lifetime Backboard are extremely durable and difficult to break, but even the best of products can wear down over time. Luckily you don't have to get a whole new system. New systems are often expensive and you may not want to go through the process of getting another one, Just call Lifetime and they will be happy to help you acquire a new backboard for your system. You have me sold on this backboard and I am actually ordering right now. :) I will leave a review of it when we get it and start using it but I am sure it will be strong enough as your products are always high quality. Feel free to contact our customer service department at 801-732-0601 if you need assistance in your purchase. Quite good post, I sure really like this fabulous internet site, persist with it. I have removed the current 30" x 48" acrylic(?) backboard form its glued to frame and in process of painting it. I need a replacement board for this - can you quote one sheet of plastic shipped to zip 45238? We don't carry the plastic sheet but you can contact Lifetime's Customer Service Department at 1-800-225-3865. I need a replacement backboard only. do not need rim only backboard. please let me know if I can get backboard only. Yes, you can reach Lifetime customer service at 1 (800) 225-3865. Trying to replace 48" backboard for lifetime system purchased about 10 years ago with 54" backboard. The backboard is not tempered glass and is mounted with square pole. Hi Mark, Yes, you can call Lifetime customer service at 1 (800) 225-3865 for assistance. I'm trying to replace a backboard on an in-ground system that is over 25 years old. I have no idea what the brand of my system is. Can the backboard be replaced with a Lifetime backboard? Your basketball system is over 25 years old it is very likely that nothing is compatible at this point as the bolt patterns have changed throughout the years. If you have a 3.5" diameter pole, and you can always purchase brackets to ensure that the backboard is compatible. You can obtain that by contacting 800-225-3865. Parts are sold separately and you shouldn't have any issues getting those parts. Feel free to contact us with any other questions. Have had a Lifetime basketball over 10 years, between weather and age the acrylic backboard has come off, completely intact. What is the best glue or adhesive to use to reattach the backboard to the frame? I need the glass backboard for our basketball goal. The rim and the pole are in good shape but the backboard is broke. The size is 36"x60" do you have this size? How do I take off the old backboard from my Lifetime hoop? I have a replacement backboard ready to put on.